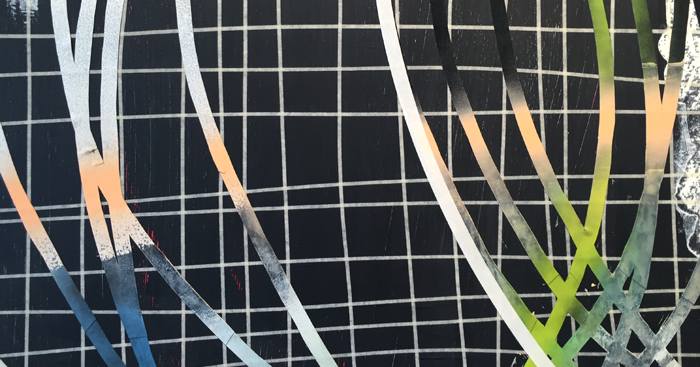 Local artist Neal Perbix gets loose and layered with new paintings at Fox Tax, opening this Saturday. Fox Tax is not your typical accountant’s office. Nestled in between I Like You, a thriving gift shop showcasing the work of local makers, and the Herbivorous Butcher, Northeast’s friendly neighborhood vegan butcher shop, the tax firm has been serving the creative community for ten years now as both tax advisors and gallery owners, using their front lobby to show interesting, challenging work by up-and-coming heavy hitters in the local art scene. 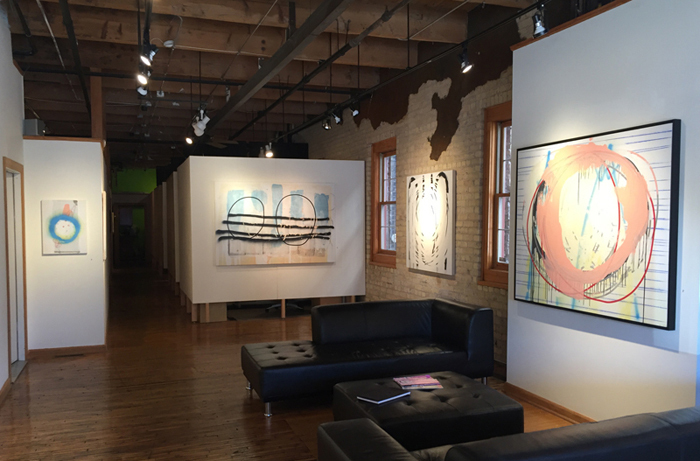 This weekend the Gallery at Fox Tax opens its fall season with new paintings by Neal Perbix. 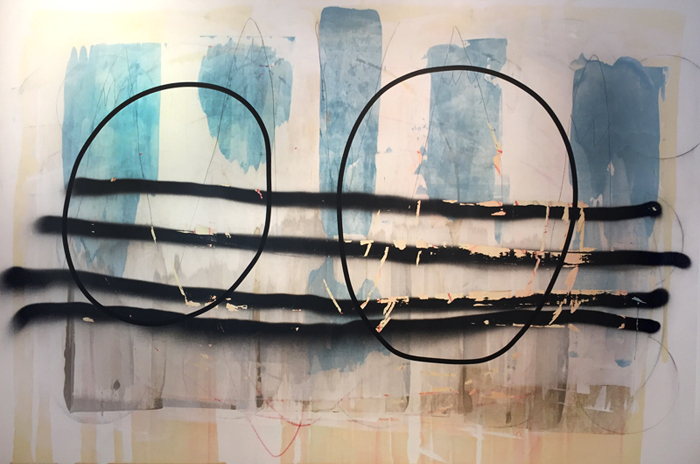 Perbix is known primarily for his “tape drawings,” large minimalist compositions of swirling circles made with thin, colored masking tape. His overlapping egg-shaped ovals play with space and stroke, hovering like deconstructed rubber band balls, frozen in a state of controlled disorder. With these newer paintings, however, he has relinquished some of that control and proven that he doesn’t mind getting his hands dirty. Each piece in the show is untitled, so we have naught to go on but the paintings themselves. His trademark tape circles are here, but their controlled austerity has been overrun by drips and doodles and spraypaint and polka dots. The work is fun, and it looks like it was fun to make. 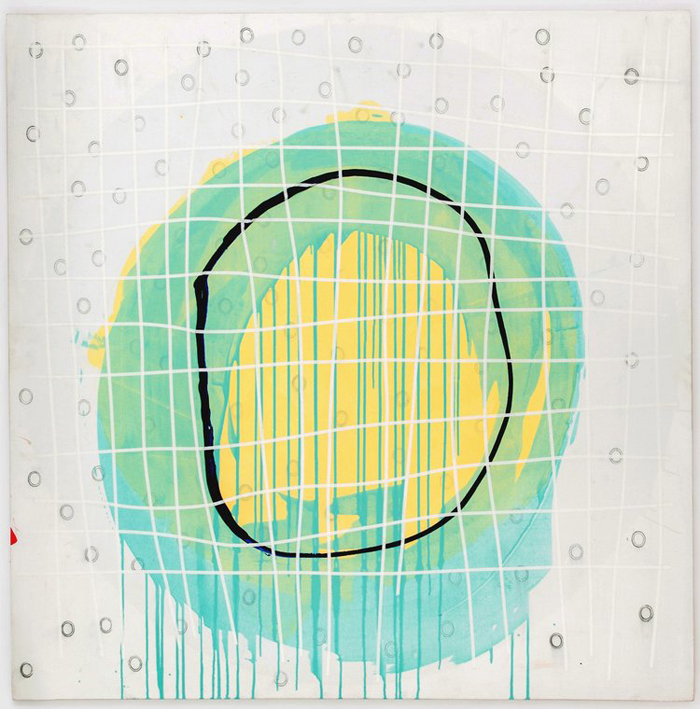 The physicality of the processes involved is evident: layers of tape and paint build up on top of each other in low-relief, while masked-off areas reveal the colors and brushstrokes hidden below. Scattered throughout are chalklines, stray marks, quick strokes, hard scrapes, and dribbles of paint. The work is best viewed up close, where you can really enjoy the playfulness in all of these details. 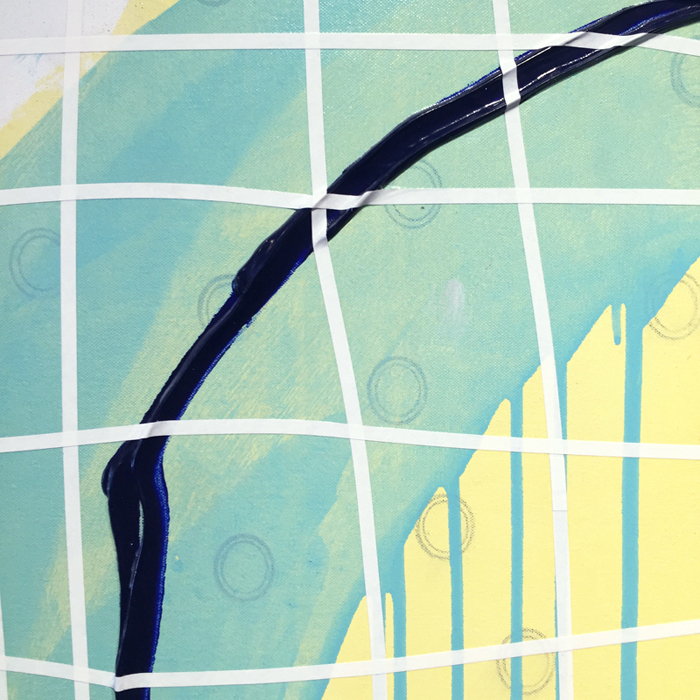 In one piece, tape lines roll right over a thick acrylic brushstroke, hugging every contour like freshly painted yellow lines over roadkill. There’s no denying that this work has a sense of humor. It’s true: sometimes this kind of weathered, geometric abstraction can be a real bore, especially when you find yourself sitting across from it in a lobby. But this is no mere hotel art, and the personal touches and spirit of experimentation in “All In” are refreshing and amiable. There are hints of narrative and figural representation as well, primarily in the snowcapped mountains scrawled childishly in some of the backgrounds. These little bits of landscape help the work feel more personal, almost like old travel postcards after a long, hard trip through the mail. With all of the material processes at his disposal, it will be interesting to see what Perbix’s next steps in the studio will be. He has already made simplicity his signature. As long as he continues to put himself in the work, there’s no telling how far a little chaos will take him. “All In” opens Saturday, September 17th at Fox Tax in Minneapolis and is on view through October 20th with gallery hours Monday through Thursday, 10am to 4:30pm. To learn more, visit the listing on our calendar.